Remember the self-tying shoes worn by Michael J. Fox in Back to the Future II movie? Nike was rumored to develop real-life sneakers for years, but now they are going to hit the stores. Nike is going to release Self-lacing sneakers named Hyperadapt 1.0, with a limited release beginning on 28th November at selected Nike locations. Hyperadapt 1.0 has an internal cable in the fishing line and also pressure sensor on the sole. 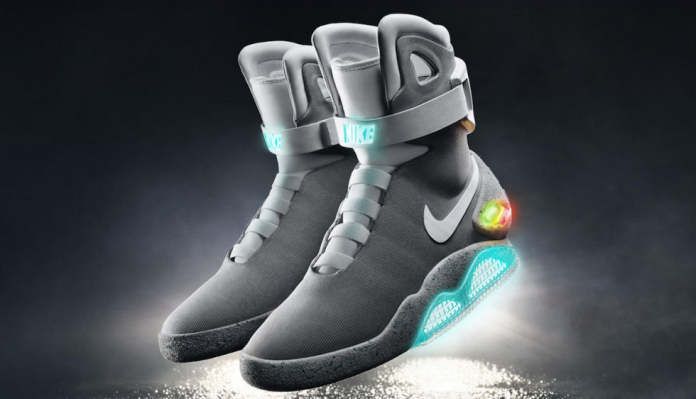 It was designed with ‘algorithmic pressure equation’ so that cables will be tightened when you put your foot into the shoe. There are buttons on the side to tighten and loosen the grip. It will be available in two colors, white and black. 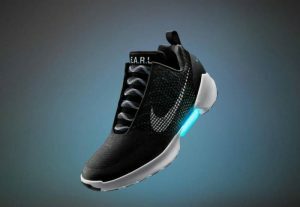 The shoes are pretty sophisticated with LEDs on the heel, which lightens up when shoes are tightening and also when the battery is low means you have to charge the shoes. It will take not more than three hours to charge, and it lasts up to two weeks. This pressure sensor will activate the self-lacing technology in the heel, and it automatically conforms the shape of the foot. The magnetic clip-on charger will be provided to top the shoe battery life. You can see the thick nylon laces on top of the sneakers, and they are just visual aids. There is no announcement has made up to now about the price tag of the Nike Hyperadapt 1.0, but you have to expect they won’t be available at low price.